Millennium 7 Publishing Co.: 9 Marketing Trends To Look For In 2018? 9 Marketing Trends To Look For In 2018? Twitter introduced a 280-character update. Instagram began testing a 4x4 grid, after also introducing the ability to include several photos per post this year. Facebook introduced Facebook Stories, a direct assault against Snapchat, which it tried to buy back in 2017. So what’s the social media forecast moving into 2018? Technology and innovations by the top social media companies are growing at rapid rates. As these online giants add exciting new features, they also bring on new users who may have been holding out for some reason or another. 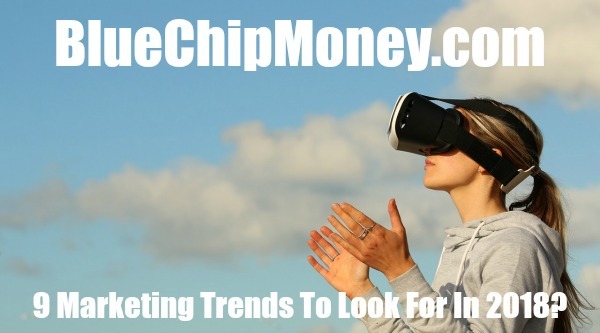 Look out for these social media trends for 2018..
At the newest iPhone launch in September 2017, Apple CEO Tim Cook announced that the newest generations of iPhones will have an augmented reality (AR) feature and demonstrated how it works to the public. Apple showed off AR applications from gaming to sports, all integrated with the iPhone camera lens. It won't be long before social media companies find ways to incorporate this new technology for use on their own platforms. Snapchat Spectacles have been talked about as a business venture that will pave the way for augmented reality. On a related note, Snapchat just released a software update that allows you to superimpose your Bitmoji into the real world. Ephemeral content, popularized by Snapchat and adapted by both Instagram and Facebook, is short-lived content that disappears after a user has viewed it or after a 24-hour period. This content format is popular with millennials and generation Z, who will be the focus of many brands’ marketing efforts in 2018. There are over 200 million people using Instagram Stories per month, which is 50 million more than those who use Snapchat, and Instagram Stories is just a touch over a year old. The concept of disappearing content may sound scary to many marketers but several brands are already using Instagram Stories for ads. Related Article: 2018 Tech Trends To Prep For? What makes ephemeral content popular is that people think it’s more authentic than planned content. With this in mind, social media trends 2018 suggest that you should post your best, high-quality content on your Instagram feed and real-time content on Stories. Another element of interest to marketers when it comes to the use of Stories is that they are located at the very top of the news feed on their respective networks, keeping your brand top of mind when our target audience is using this feature. With Stories, there’s a component of fear of missing out and an impulse to take quick action, because the content is gone after 24 hours. A study by Goldman Sachs found that by next year, Generation Z will be more valuable to most organizations than millennials. The oldest members of Generation Z are aged between 17-22 and are starting to enter the labor force or university and will enjoy increased spending power as a result. Gen-Z are considered the true digital natives, as they were born with devices in hand and are very expressive and outspoken. Generation Z maintains a social media presence with thousands, if not millions, of followers. To definitively reach Generation Z, brands need to be on the platforms that Gen Z prefers, such as Snapchat and Instagram. Brands also need to create more personalized content, because like millennials, Gen Z puts a premium on authentic experiences. 90% of marketers that have used influencer marketing found it to be successful, so it seems fair to forecast that it won’t be going away anytime soon. However, influencer marketing hasn’t been without its challenges. Most brands will be taking advantage of some type of influencer marketing, but not all are transparent about it. Instagram rolled out an update to try and address this issue. The update displays a subheader under the influencer’s username which says “in paid partnership with”, in order to disclose sponsored posts. Consumers may become bored with seeing influencers with 10,000 followers promoting brands that aren’t related to their niche. Influencers will likely become more selective about who they decide to work with. For 2018, building relationships with key influencers is something brands should focus on. Building relationships is complex, since each influencer is different and will require personalized messaging. Social media trends 2018 may also involve brands turning to real experts instead of social influencers. 2017 saw the rise in popularity of video content, which is effective in getting attention, engagement, and followers. On that note, video is the fastest growing ad format. By 2020, it is expected that video will make up 80% of consumer internet traffic. Social media sites have also started offering in-app live-streaming and ways to create ephemeral content. What was once a novelty became a mainstream focus of social media, with some brands turning to livestreaming to capture the attention of their followers. An added advantage of livestreaming is that it requires commitment, keeping uninterested audiences away. You can also expect that your simple image posts will receive less reach, as they are outperformed by moving images and videos. Thankfully, by using a few nifty apps, a smartphone and a shred of creativity, it's pretty easy to put your stills into motion. Video has been increasingly important and popular lately, so video hangouts may be the next iteration or progression of this social media trend. New social media in 2018 may include the likes of Houseparty, a video hangout platform used by over one million people daily, composed mostly of Gen Z. Facebook is reportedly building something similar to it, tentatively called Bonfire. Facebook, who also owns Oculus (a virtual reality hardware and software company) is also testing a project called Spaces, which seeks to connect friends in VR. Facebook is set to scale the project in 2018. A study found that 59% of links shared on Facebook have never been clicked, meaning that many people just read headlines without taking the time to digest the whole story. After some snafus in the 2016 United States presidential election, social media sites have started to embrace a more personal approach to governing conduct on their platforms. Facebook, which was criticized as one of the major channels for spreading fake news, is exploring methods to update their machine learning to track possible hoaxes and send them to human fact checkers for review. Social media has become a popular medium for providing customer service, apart from email and phone calls. Some people prefer this over the latter two options because with social media, you get real-time updates and answers. However, large businesses tend to receive more social media inquiries than what human agents can reasonably handle, which are often just the same questions over and over again. Instead of (or in addition to) creating a FAQ page, many businesses are building chatbots to assist customers looking for further information. A chatbot is a software application built to stimulate human conversation. In fact, there are over 11,000 monthly active bots on Facebook Messenger. Gartner has predicted that by 2018, 30% of our chat conversations will be with chatbots. If you're not using chatbots for your business, Hubspot claims that you’re already behind. Contently predicts that by 2020, 59% of US users will access Facebook exclusively by mobile device. This prediction doesn’t sound too far-fetched, as the 80% of the company’s advertising revenue comes from mobile ads. Facebook wasn't initially designed for mobile, but with popular apps like Snapchat and Instagram, which are completely mobile-based, Facebook had to adapt in order to stay at the top of the social networking ranks. Knowing all this, it’s best to optimize for mobile ads specifically when using the platform’s paid ads feature. Guest Authored By Maddy Osman. Maddy is a Content Marketer with an SEO/Web-Designer edge at The BlogSmith. Follow Maddy on Twitter. Social media gave brands and their customers a chance to connect and the major players are constantly coming up with more ways to do so.